^ Otterson, Joe. "'The Simpsons' Renewed for Season 31 and 32 at Fox". Variety.com. Variety Media, LLC. Retrieved 6 February 2019. ^ "The Best of the Century". Time. 1999-12-31. ^ "I, (Annoyed Grunt)-Bot". The Simpsons. 2004-01-11. Fox. ^ Doherty, Brian (March–April 1999). 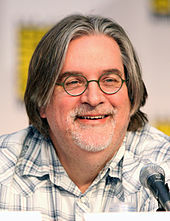 "Matt Groening". Mother Jones. 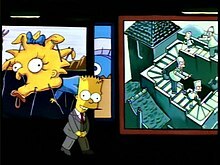 ^ First episode credit in production order: Groening, Matt; Sam Simon, David Silverman, Kent Butterworth (1990-05-13). "Some Enchanted Evening". The Simpsons. Season 1. Episode 13. Fox. 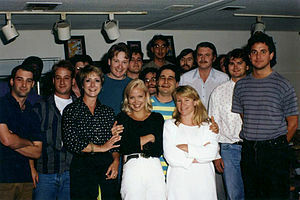 ^ First episode credit in production order: Jean, Al; Mike Reiss, Jeff Martin, George Meyer, Sam Simon, John Swartzwelder, Jim Reardon (1991-10-31). "Treehouse of Horror II". The Simpsons. Season 3. Episode 7. Fox. ^ First episode credit in production order: Meyer, George;Jim Reardon (1992-10-08). "Homer the Heretic". The Simpsons. Season 4. Episode 3. Fox. ^ First episode credit in production order: Swartzwelder, John; Susie Dietter (1995-09-24). "Radioactive Man". The Simpsons. Season 7. Episode 2. Fox. ^ First episode credit in production order: Cohen, Joel H.; Matthew Nastuk (2003-11-30). "The Fat and the Furriest". The Simpsons. Season 15. Episode 5. Fox. ^ "She Used to Be My Girl". The Simpsons. 2004-12-05. Fox. ^ "7 věcí, na které se můžete těšit ve 30. sérii Simpsonových". Cool magazin (in Czech). Retrieved 2019-02-15. ^ Jean, Al (2019-04-03). "yes". @AlJean. Retrieved 2019-04-04. ^ Andreeva, Nellie; Andreeva, Nellie (2019-02-06). "'The Simpsons' Renewed For Seasons 31 & 32 By Fox". Deadline. Retrieved 2019-02-06. ^ "'Simpsons' Creator Matt Groening Says Debate Around Apu Is 'Tainted'". New York Times. Retrieved 2018-07-18. ^ Lam, Katherine (2018-05-01). "'Simpsons' creator Matt Groening on Apu controversy: 'People love to pretend they're offended'". Fox News. Retrieved 2018-05-01. ^ Lisa Respers France. "Hank Azaria willing to 'step aside' from playing Apu on 'The Simpsons'". CNN. Retrieved 2018-05-01. 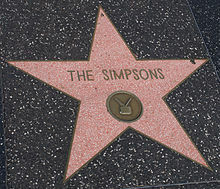 ^ "The Simpsons Indian character Apu 'axed' after racial controversy". Sky News. Retrieved 2018-10-29. ^ Bradley, Bill (2014-04-09). "'The Simpsons' Launches On FXX With Longest Continuous Marathon Ever". The Huffington Post. Retrieved August 19, 2014. ^ Kissell, Rick (2014-08-22). "'The Simpsons' Marathon More Than Triples Primetime Audience for FXX". Variety. Retrieved August 24, 2014. ^ Kondolojy, Amanda (2014-08-28). "FXX Paints Labor Day Weekend Yellow". TV By the Numbers. Retrieved September 2, 2014. ^ "The Simpsons – The Complete 3rd Season DVD Information". TVShowsOnDVD.com. Archived from the original on 2012-10-18. Retrieved 2012-08-04.